In this video, we will discuss configuring wsHttpBinding to use transport security mode and basic client credential type. The following MSDN article contains all the system provided bindings and their security defaults. Here are the steps to configure wsHttpBinding to use transport security mode and basic client credential type. Step 1: Create a class library project with name = SimpleService. Delete the auto-generated class1.cs file. 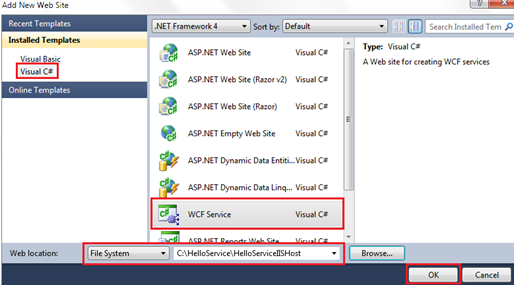 Step 5: Now, let's host the WCF service in IIS. We discussed this in detail in Part 29 of WCF tutorial. Right click on SimpleService solution in Solution Explorer and select Add - New Web Site. Fill in the details as shown in the image below. Step 6: Delete IService.cs and Service.cs files that are present under App_Code folder. Step 7: Add a reference to SimpleService WCF library. To do this, right click on SimpleService\SimpleServiceIISHost project in Solution Explorer and select "Add Reference" option and add a reference to SimpleService project. 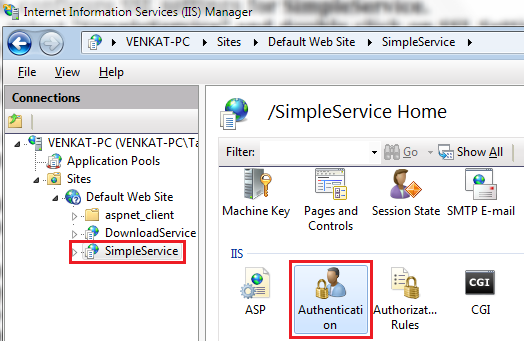 Step 8: Rename Service.svc file to SimpleService.svc. Copy and paste the following code in SimpleService.svc file. Step 11: Enable message logging for the WCF Service. We discussed this in detail in Part 9 of WCF tutorial. Step 15: Double click on the button to generate the "click event handler" method. Copy and paste the following code in Form1.cs file. Step 16: Run the WCF service and the client applications. Click the button to invoke the service. Inspect the logged messages and notice that the body of the SOAP message is encrypted, which implies that the wsHttpBinding is using message based security. 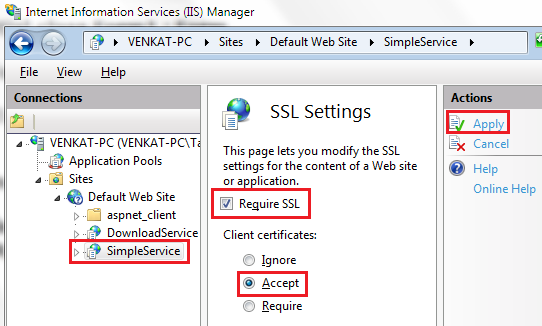 Step 17: Create a self-signed SSL certificate using IIS. We discussed creating self signed certificates in Part 101 of ASP.NET tutorial. Step 18: In IIS, add Https binding using the self-signed SSL certificate created in Step17. 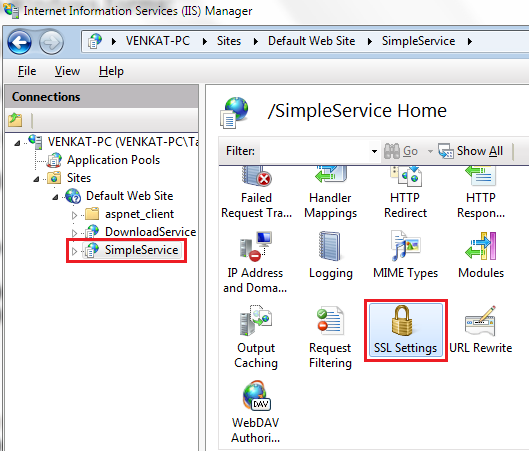 Step 19: In IIS, configure SSL settings for SimpleService. a) To do this, select "SimpleService" and double click on "SSL Settings"
b) Select "Require SSL" check box and "Accept" radio button under "Client certificates" and then click on "Apply" link button. Step 20: In web.config, include the following bindings section, to customize the wsHttpBinding to use Transport security and Basic client credential type. 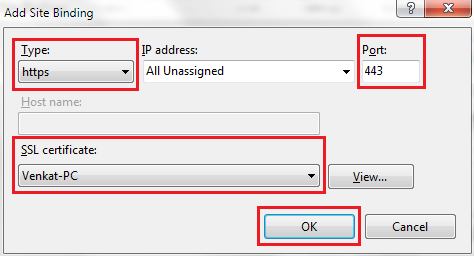 Step 21: Associate the above customization with the service endpoint using bindingConfiguration attribute as shown below. Step 22: At this point, trying to navigate to https://localhost/SimpleService/SimpleService.svc will throw the following error. Security settings for this service require 'Basic' Authentication but it is not enabled for the IIS application that hosts this service. 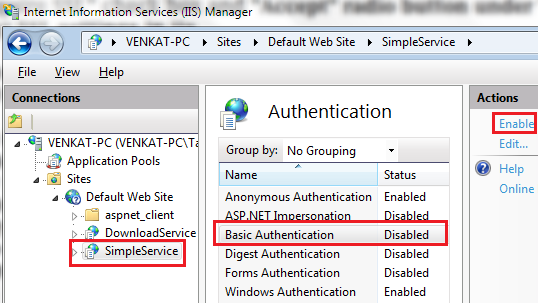 a) In IIS, select "Simple Service" under "Default Web Site" and then double click on "Authentication" icon. Step 24: Trying to navigate to https://localhost/SimpleService/SimpleService.svc will throw the following error. The HttpGetEnabled property of ServiceMetadataBehavior is set to true and the HttpGetUrl property is a relative address, but there is no http base address. Either supply an http base address or set HttpGetUrl to an absolute address. Step 25: To fix the above error, change <serviceMetadata httpGetEnabled="true" /> to <serviceMetadata httpsGetEnabled="true" />. Save the changes and then navigate to https://localhost/SimpleService/SimpleService.svc. At this point we should be able to see the SimpleService WSDL. Step 26: In the client application, delete the SimpleService service reference, and then add the service reference again to SimpleService. This time use https://localhost/SimpleService/SimpleService.svc instead of http://localhost/SimpleService/SimpleService.svc. Notice that we are using Https instead of Http. At this point, notice the configuration in the app.config file of the client application. Notice that instead of the defaults of wsHttpBinding, we are now using "Transport" security mode and "Basic" client credential type. Step 27: Run the client application, and then click "Call Service" button. The following error will be thrown. The username is not provided. Specify username in ClientCredentials. Step 28: To fix the above error, modify the code in btnCallService_Click() event handler method in Form1.cs of the client application as shown below. Step 29: Run the client application, and then click "Call Service" button. We now get the out put as expected. Inspect the logged messages and notice that the body of the SOAP message is not encrypted, which implies that the wsHttpBinding is now using Transport security.